The importance of having a ritual or regular practice has become more apparent in my life these past few months. With the increase in time that I am able to spend caring for my family, taking care of unfinished projects, building my business, writing, helping the kids with homework, reading and making sure dinner is made each night - the need to make time for myself to get centered, clear my mind and prepare myself for the day has become so important. It helps me to gain clarity with what I need to accomplish each day and helps me efficiently complete tasks so I'm not overwhelmed and stressed by the end of the day. 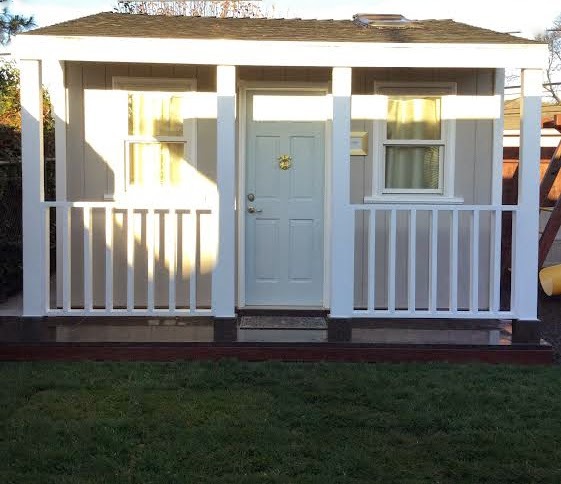 There's been a number of lessons I've learned and tips on a number of things I've encountered that I'll share with you, but today I felt the urge to share my personal meditation space with you. I created a space in my new studio where I go each morning to meditate. This photo above shows how it looks like - with my meditation pillow (yes it's furry and I love it), along with some of my crystals that I use. I'm a big rock and crystal collector, I've been ever since I was little. When I was 4, my parents took me to the Grand Canyon and when we got back to the car they were wondering why my backpack was so heavy? Of course, I had filled it completely with stones! So now, I try to carry on my tradition and purchase a stone whenever I travel or when close family and friends travel they bring me stones back from their trips. I LOVE it and it's more meaningful that way. I have a beautiful purple/fuchsia Belgium rug on my studio floor that I feel is just naturally grounding, so I set my mediation pillow down on it, light a candle, choose some crystals for the day, plop right down and close my eyes. 1) Grey faux fur meditation pillow (ok, actually it is a dog pillow, but I fell in love with how pretty and comfortable it was in the store and it turned out to be perfect). I found mine at Home Goods, but there is a similar one HERE. I'd been searching for the perfect meditation pillow for a while and I couldn't quite find one that I really loved and that reflected my personal style, until I ran across this faux fur pillow. Sometimes the best things come in unexpected places. 2) Crystal Quartz Cluster - I found this with my sister at the Mystic Dream Shop on a day trip in Walnut Creek. It's one of those rare finds I was drawn to - right when I saw it and held it I knew it was meant for me! 3) Tiger's Eye Point - My sister got this for me for my birthday a couple years ago. It's a great stone for grounding + she's a Reiki master so she charged it for me as well. 5) Raw Rose Quartz - My parents brought this love stone back for me from Baden-Baden, Germany. 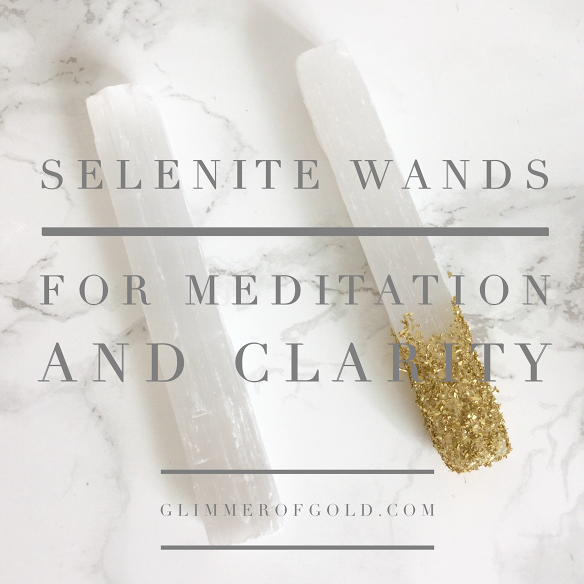 5) Selenite Wand - I'm selling a few in my shop HERE so it's easy to purchase + I'm offering it with GOLD German Glass Glitter as well. 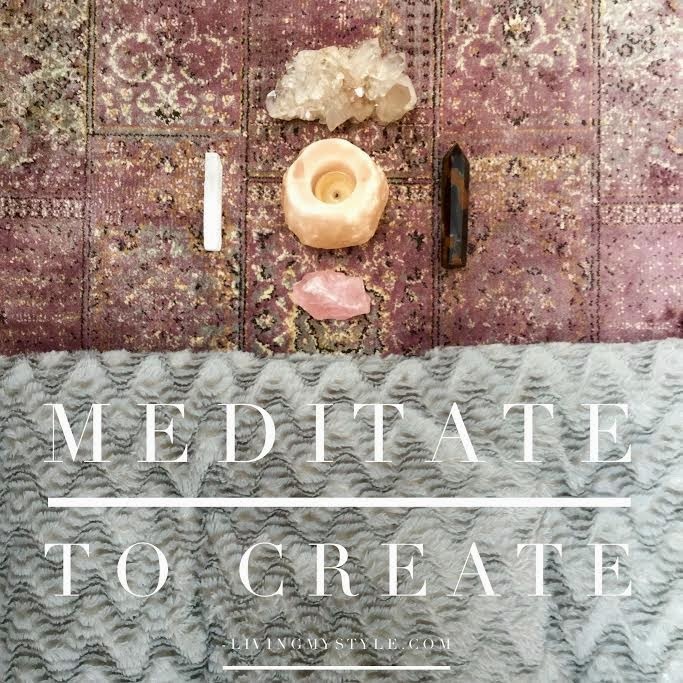 If you have a little more time on your hands and would like to create a more visual guided meditation practice, listening to Lisa Nichols' Creative Visualization really helped me. Each meditation is about 15-20 minutes long and it very vivid and detailed in helping to create the reality you would like to bring into your experience. You can also check out Gabrielle Bernstein's guided visualizations on YouTube. Gabby has great information and tips on building a spiritual practice. I love hearing her speak and reading her books - Miracles Now is one of my favorite books which I regularly refer back to. However, even if you have just 5 minutes a day before heading off to work to stop, sit and center yourself, it can really make what seems to be an overwhelming day ahead filled with a long to-do list, much more manageable in your mind. It might take a little bit of practice to quiet down the thoughts in your head, but after a few days I already felt a shift in my mind and body. Hey, it's definitely worth a shot! As you all know, I'm definitely a Leopard Lover. I love the colors and the simplicity of the spots. I think little pops of leopard accents create an air of chicness to not just an outfit but to a room. The leopard print has been around for so long, and done up properly is practically a staple in fashion. 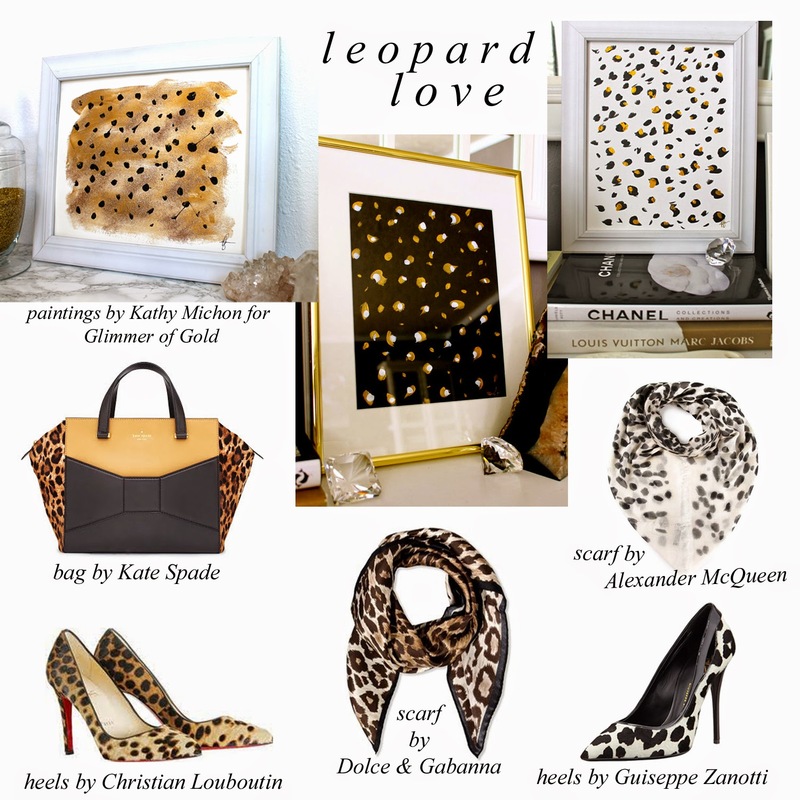 I'm adding on to my Leopard Love collection with another special piece that not only reflects the "chicness" of the actual print but also adds some glam to your walls so you can accessorize your space as you would your outfit. This the new piece I just released in my shop. I couldn't quite capture just how AWESOME in looks in person with the shine of the metallic paint alongside the sparkle from the glitter, but take a look. Also, I'll be having an open studio coming up and if you're around locally in the SF Bay sign up in the email list (to the left of your screen) to be added to my list when that happens and you can come see all the pieces in person as well as my sweet studio! A couple of new paintings are available now in my SHOP. My love for floral blooms continue and I've released 2 paintings on 8x10" canvas - "NOIR" and "CONFETTI". It is the prefect accessory for your desktop and walls. Even if you can't have fresh flowers each day on your desk, the pop of color from these floral blooms will definitely brighten up your workspace, bedside table, or bookshelf! "C O N F E T T I"
Some of you might have noticed that I've revamped my blog, and I hope you all like it! Also, there's a bunch of new and exciting projects that are currently in the works right now, so please come back to visit and signup on my email list (just to the left of this screen) - that way you can get notified when new products are added and to get the info on all the exciting news coming up! 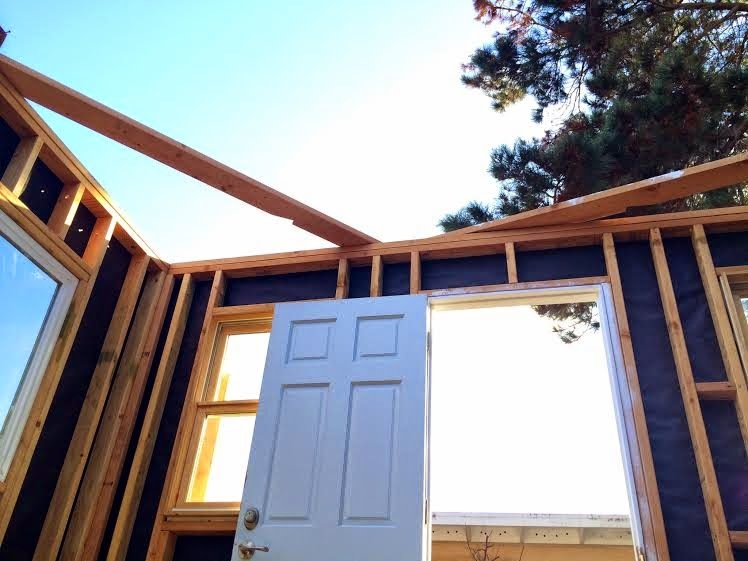 My wonderful husband and my father-in-law worked together all day, everyday for a few months to build this BEAUTIFUL art studio, home office from the ground up! It has been a complete blessing for me and I am overwhelmed with gratitude for this amazing space to center myself, paint and just make things! 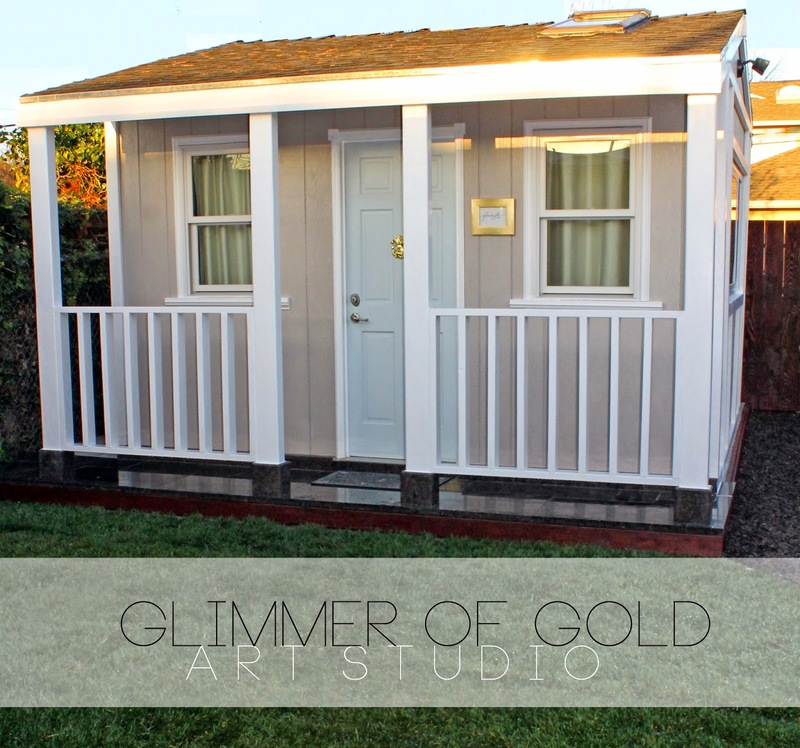 It was built with so much love and I can't wait to share with you all the new pieces that I create in here for Glimmer of Gold. 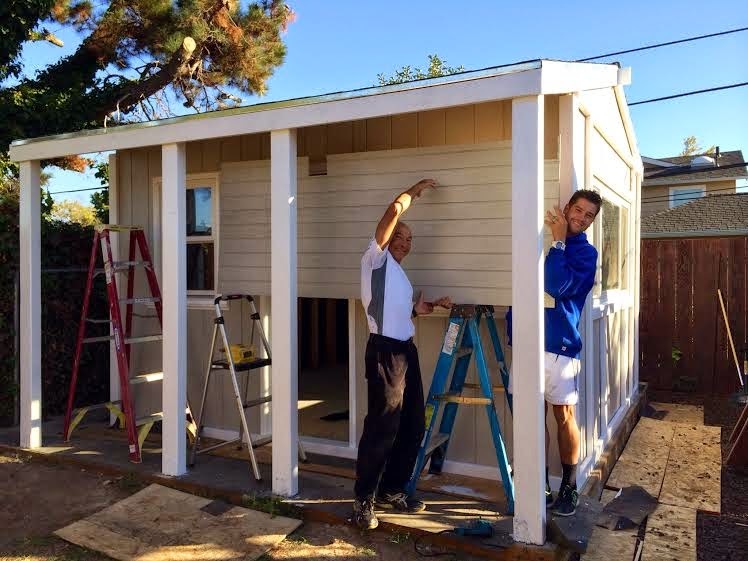 My initial inspiration for the exterior was to mimic a small summer beach cottage where I could escape to daily to paint, create, and even meditate. 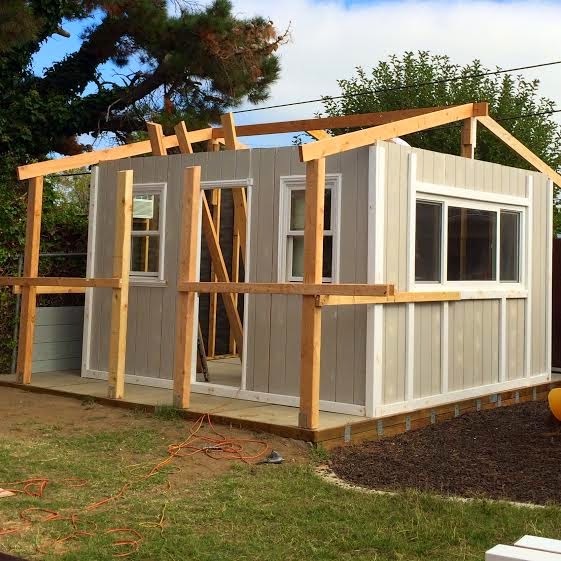 I was inspired by the Hampton's, Cape Cod, and Martha's Vineyard so I chose light beach colors for the exterior paint - Behr Graceful Gray & Ultra Pure White. 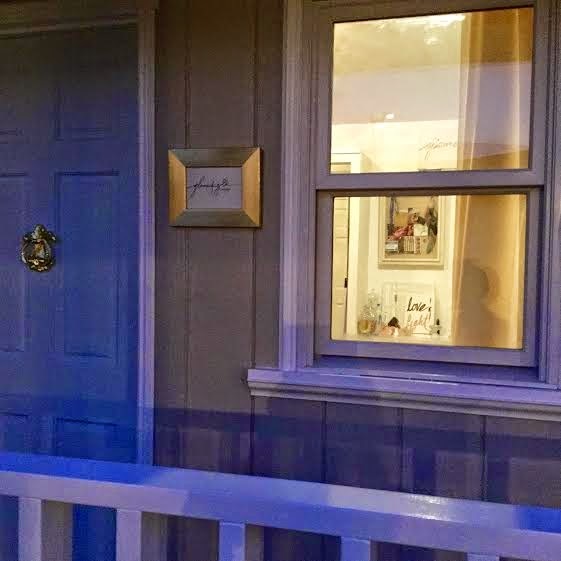 For the door color I used Behr's Offshore Mist which I LOVE because it is the perfect subtle, soft blue shade. Stay tuned for more detailed photographs of the art studio interior and how I chose to decorate a small space to represent my style. Subscribe to my blog (on the left) to stay updated on new posts. ... and we're open for business!